Support the struggle of the Consortium’s member Ekuri Initiative to prevent the destruction of their community forest to develop a dubiously useful “super-highway”! Follow their action in the dedicated website: Save Ekuri Forest! 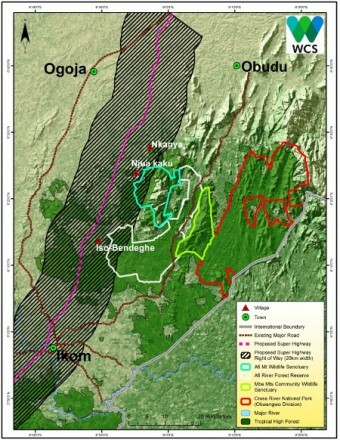 The ICCA Consortium has written (February 29, 2016) to top national authorities in Nigeria to express its serious concerns regarding a impending so called “super-highway” expected to be built across the Ekuri community forest in Cross River State— one of Nigeria’s last and most precious surviving rainforests. Work to begin clearing the forest for the “super-highway” is said to be imminent in Ekuri’s land and has seemingly already begun in neighbouring land, engendering the desperation of local communities. This initiative, which is proceeding in absence of any environmental and social impact analysis and certainly without the Free, Prior and Informed Consent of the relevant communities– violates international obligations in terms of human rights and indigenous peoples’ rights and is squarely in contradiction with CBD and UNFCCC obligations to which Nigeria has freely adhered. Along with other remaining rainforests in Cross River State, the Ekuri community forest is of global significance. The Ekuri and Okokori communities and our Memebr Ekuri Initiative have already written to the Governor of Cross River State to oppose the “super-highway” project and we join our voice to their voices hoping to prevent irremediable ecological impact, socio-cultural and human impact and economic, financial and reputational impact for Cross River State and Nigeria a whole. 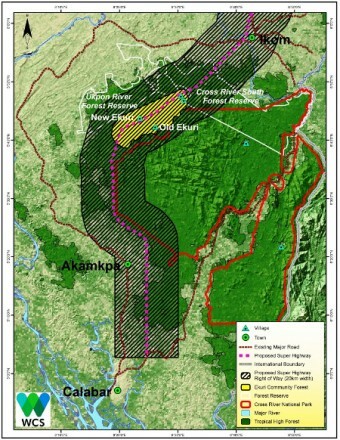 We appealed authorities to suspend all field activities for the so-called “super-highway” project and in particular to suspend all forest logging and clearance already commenced without EIA permit from the Ministry of Environment of Nigeria and to rescind the related land acquisition along the route through forested areas. 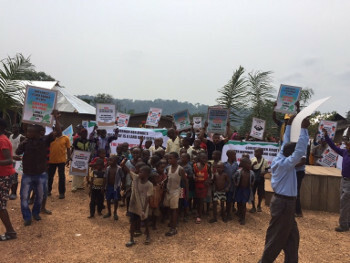 We urge a thoroughly participatory and transparent review of the ecological, socio-cultural, economic, financial and reputational impacts of the so-called “super-highway”, to examine all alternatives routes that avoid the destruction of the Ekuri community forests and other forested parts of Cross River State, and to enhance awareness of the value of governance, management and conservation capacities of the local traditional institutions of forest communities in Cross River state and Nigeria as a whole.